This seems like such a dumb question, but I can't figure it out. When I run my TestNG tests, if they succeed then I can't see the output from them. How can I view the output from successful TestNG tests? (See attached screenshot). I can't figure out how I can get to the test output. How do you run the tests? Right click on a test class and 'Run my-test-class'? Something else? I right-click on the project and select Run -> All Tests. 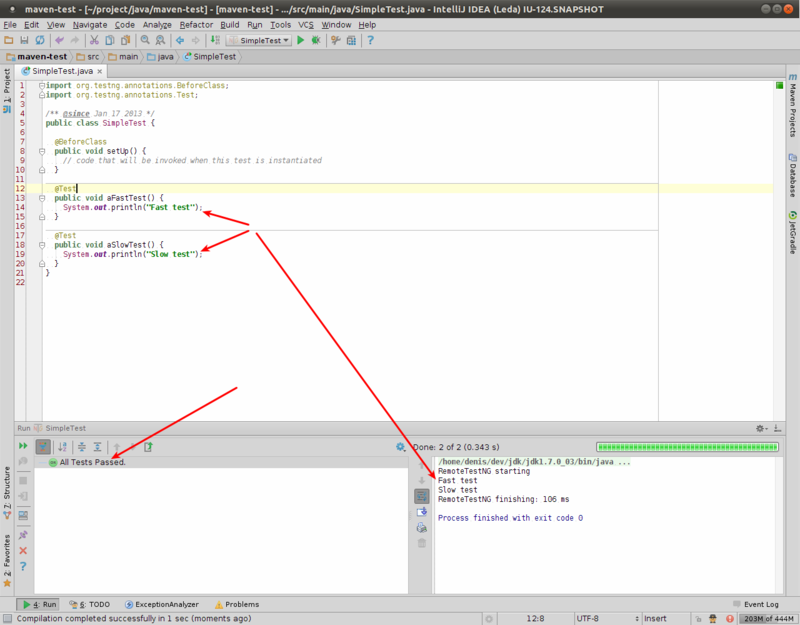 Still unable to reproduce that (tests stdout is written in a control identified by a red arrow at the screenshot posted above). Please provide a sample project and your settings (Main Menu | File | Export Settings). Sorry to revive this old thread, but I'm facing this same issue. I can see output only at some times. From what I can infer, output is printed but it is cleared immediately. Only "Process finished with exit code 0' is printed in the end. There is a possible case that more than one test is executed. Then there is a 'shared log' and 'per-test log'. The first one is automatically cleared as soon as the test complets but you can click test node (at the left) to see exact test output. Excellent! I can see output now. Thanks a lot. same thing happening and it is annoying! when individual test runned console output is not visible only thing visible at console is Process finished with exit code 0.